To call Siri into action, press and hold the Home button until you hear a tone and then start talking. Pretty simple, eh? At the bottom of the screen, you’ll see a picture of a microphone inside a circle. The question, “What can I help you with?” appears on the screen. Alternatively, when the screen isn’t locked, bring the phone up to your ear and wait for that same tone, and then talk. Siri responds also when you press a button on a Bluetooth headset. 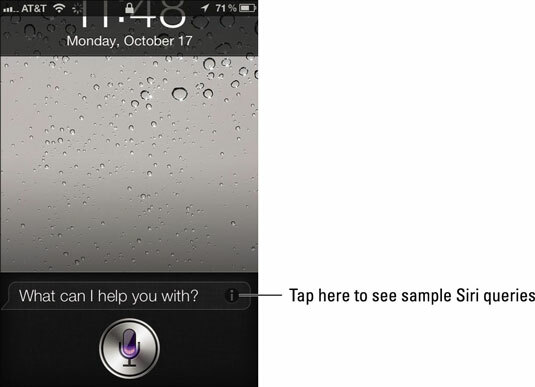 Siri relies on voice recognition and artificial intelligence. She’ll respond in a conversational (if still slightly robotic) manner. But using Siri isn’t entirely a hands-free experience. Spoken words are supplemented by information on the iPhone screen. And just where does Siri get that information? She seeks answers from the web using sources such as Yelp, Yahoo!, Open Table, and WolframAlpha, which you can learn more about in the coming sidebar. She taps into Location Services on the phone. And Siri, as of iOS 6, can open apps, Apple’s own as well as third-party apps. Indeed, from your contacts, Siri might be able to determine who your spouse, coworkers, and friends are, as well as know where you live. You might ask, “How do I get home from here?” and Siri will fire up Maps to help you on your way. Or you can ask, “Find a good Italian restaurant near Barbara’s house,” and Siri will serve up a list, sorted by Yelp rating. She can even let you make a reservation (via Open Table).